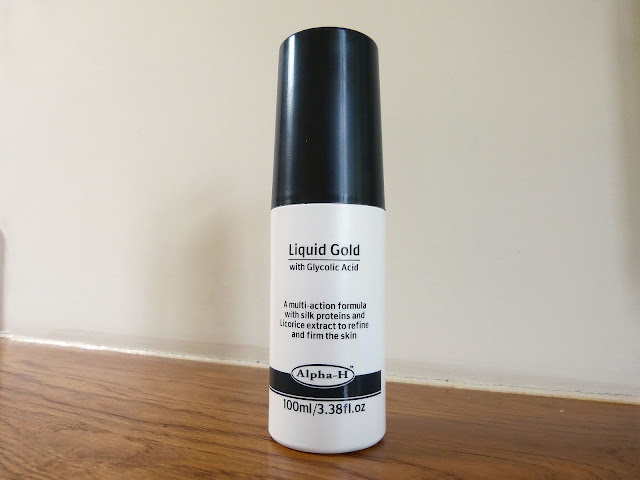 I was so excited about Alpha H Liquid Gold, I'd read numerous reviews by various beauty bloggers and the overall verdict has been pretty impressive. Liquid Gold is a chemical exfoliant, it contains glycolic acid which acts as a resurfacer for your skin. I don't have terrible skin (anymore) but I do have some fine lines, a few enlarged pores, some minor acne scarring and a patch of hyper-pigmentation that I could definitely live without. I also feel like my skin could be a bit smoother and could look a bit brighter so I decided to give it a go. What had I got to lose? £31.50 for a start. Phew! 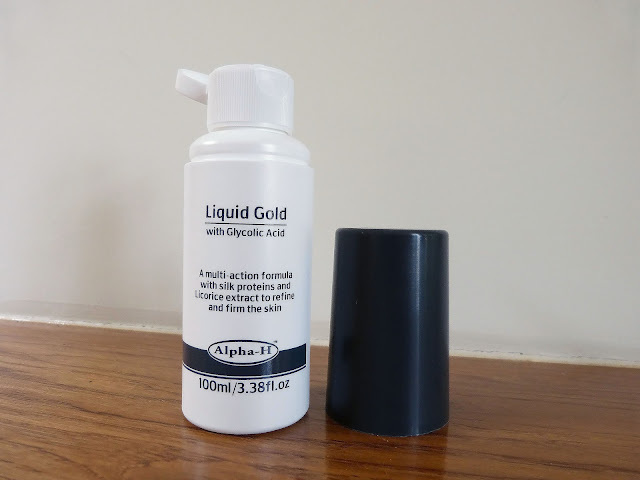 I've been using Liquid Gold every other night, swept over my face on a cotton pad and not followed up with moisturiser, as recommended. I'm a lazy bint by nature so skipping moisturiser is not a problem for me in any way and, according to Alpha H, this makes Liquid Gold more effective. The liquid is clear and very much like water in consistency but has a strong chemical smell, reminiscent of an acne medication I was prescribed years ago (I think it was Retin-A or Zineryt) and it tingles in the same way when applied. I wanted to love this product, I really did. I was assured by the reviews I'd read that I would see a difference after the first use. I didn't. I kept it up for six weeks and I'm still waiting. 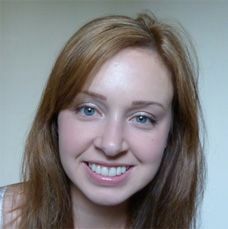 I have studied my face in order to write this review and genuinely, the only improvement I can see is that the pores around my nose look slightly reduced. At least I think they do. If you'd like to try a chemical exfoliant but you're not inspired by this review (and let's face it, who could blame you?) I'd highly recommend Dermalogica Gentle Cream Exfoliant which I reviewed last month. I hate to be disappointed by an expensive purchase! Have you ever made an expensive beauty mistake like this? I'm actually relieved to read this, as I'd been wanting to but it but having a mental struggle with myself about whether I really wanted to fork out £31.50 when my skin is pretty much fine (never satisfied, are we?). Everyone raves about this so much and it's actually nice to read a good, honest review rather than some of those you read where the blogger has got caught up in the excitement of owning the product - I feel that sometimes, this causes people to see things that aren't there in terms of the effect a product is having. I know a lot of people rave about this product but I hated it. I don't think Glycolic reacts with my skin very well. It seemed to make my acne worse not better. Glad to hear I'm not the only one who doesn't lovey this!